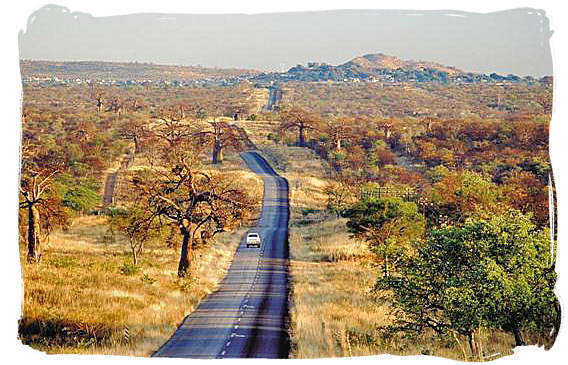 All About Driving in South Africa, Information, Roads, Traffic rules. roads, rules, conditions, distances, directions, etc...etc. 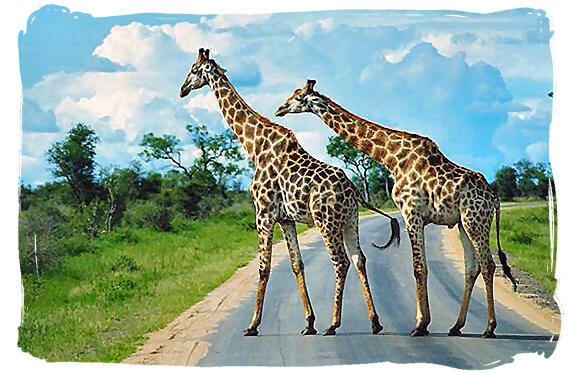 Learn all you want to know about driving in South Africa, including our safe and outstanding road infrastructure, traffic rules and other relevant information, to make a self-drive tour through our country a safe and attractive option. South Africa is a very large country. Over some of the longer driving distances it can take days to get from one place to the next. But with some planning and preparation you will be able to cover most of the country's highlights in a two to three week holiday. Provided you take the normal common-sense precautions, South Africa's driving conditions are as safe as in any other tourist destination in the world. Spending time and effort on the preparations for a journey is essential if you want to make the most of your trip. Examine your maps and study them. Select the routes you wish to follow and the time it is going to take to get to your destination and make sure you have this info at your fingertips when you need it. A great help with your preparations is the South Africa driving Directions Finder of google maps. Next to showing the location of any place you are looking for in South Africa, it will also show how to get there together with a detailed route description. Alternatively you can use the two boxes below. All you need to do is clear the boxes and fill in your place of departure and your destination, push the "Get Directions" button and see the results instantaneously. If you only want to to find out the location of a place in South Africa, fill in the place of departure only and push the "Get Directions" button. 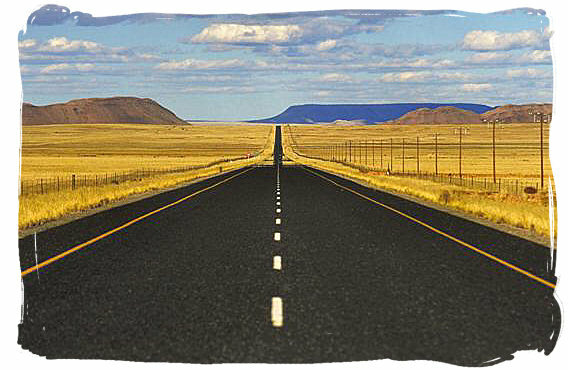 The distances are long and the roads are straight in South Africa. Often you will find and feel yourself driving in the "middle of nowhere". Look out for concentration levels going down and fatigue setting in. A proper route plan which includes a sufficient number of overnight, rest and refuelling stops, will take care of most of the tiredness and stress during your trip. Take a 15 minute break at least every two hours and make sure you get good quality sleep every night. Check the overall roadworthiness of your vehicle before you leave. See to it that the vehicle is in optimum condition. Check the tire pressures (including the spare wheel), the battery, the fluid levels, the windscreen wipers and the lights. Always have enough fuel to reach the next petrol station. 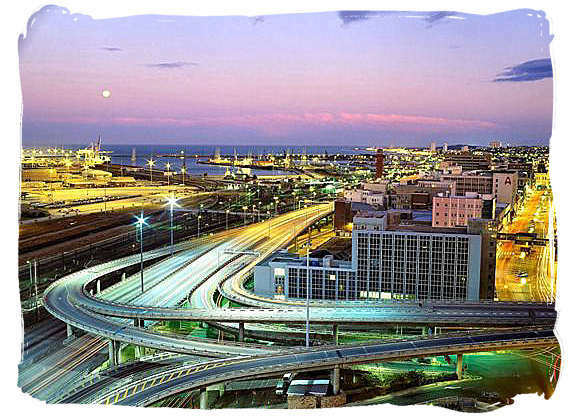 Designed and built to the highest international standards, the road infrastructure in South Africa comprises freeways, highways, national and provincial main roads which measure up with the best in the world. With the corresponding high safety factor, you can be sure of a smooth and enjoyable ride. 9,600 km of asphalt surface national and metropolitan highways, including 2,400 km of toll roads of the highest standard. National highways are recognized by a number prefixed with the letter "N". Metropolitan highways are recognized by a number prefixed with the letter "M". 65,000 km of asphalt surface provincial roads of a very high standard. Provincial roads are recognized by a number prefixed with the letter "R". 300,000 km of un-surfaced roads in excellent condition, recognized by just a number without prefix. Perfectly drivable with an ordinary 2WD vehicle. 168,000 km of tarred and un-surfaced urban roads in good condition. 221,000 km unclassified roads in rural areas. 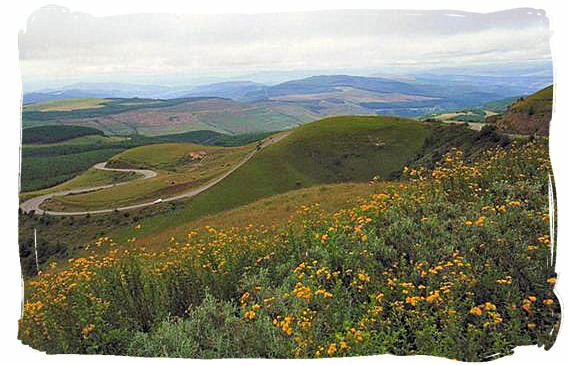 South Africa driving conditions of most of them are good enough for ordinary 2WD vehicles. A number of South Africa's national highways have been privatized and have become toll roads where you have to pay a fee before you can get onto them. It can be hassle when you are driving along nicely and all of a sudden a toll gate appears that you were not prepared for. Rather be prepared by having either cash or credit card ready when you have to pay. Apart from the odd exception, there are no official roads in South Africa which would necessitate a 4 wheel drive vehicle. Even the dirt and gravel roads in the off the beaten track rural areas and self-drive national parks, are in a sufficiently good condition for the average 2 wheel drive vehicle to cope adequately. National Highways, recognized by a number prefixed with the letter "N". Metropolitan Freeways, recognized by a number prefixed with the letter "M". Provincial main roads, recognized by a number prefixed with the letter "R"
Asphalt surfaced secondary roads and gravel roads, usually recognized by just a number. Urban roads and streets, these are non-national and fall under the responsibility of the municipalities, driving conditions are usually good. Unclassified roads, off the beaten track in rural areas, important to find out about driving conditions before you travel on them. Tips for navigating the above map. The button in the left-hand top corner allows you to select a larger version of the map. The button in the left-hand bottom corner allows you to change from street map to satellite view and vice versa. The plus/minus button in the right-hand bottom corner allows you to zoom in and out. You can zoom in to a detailed street map of any city or area that you select. Alternatively, put the mouse cursor on any location on the map that you want to explore and click repeatedly with the left hand mouse button without moving the mouse. Moving the mouse cursor on the map with the left hand mouse button clicked in, will allow you to move the map up and down and left and right. Click on the refresh button of your browser to return to the original map. The following are locations where you can access interactive maps of South Africa. They will allow you to zoom in to street level and then print out the map to help you find your way. You will also find information about hotels and guest houses in the area you are planning to visit. INTERACTIVE MAP,... Enables you to find addresses, restaurants, accommodation, routes etc. on an interactive map. MORE MAPS OF SOUTH AFRICA,... To help you learn more about the geography of South Africa. To find out what the travel distances are between the major cities in South Africa, use the South Africa driving distance table below. The distances are shown in kilometers and you can divide them by 1.6 in order to convert them to miles. 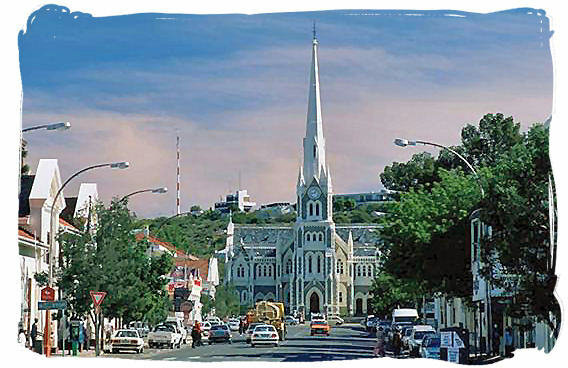 Main street in the historical town of Graaff Reinet. South Africa driving rule number one... we drive on the left-hand side of the road and all vehicles in South Africa are right-hand drive. Minimum age requirement for a drivers license is 18 years. Unit of measurement for distances and speed is in kilometers. Wearing seatbelts is a legal requirement. It is not allowed to use a mobile phone while driving. Parking a vehicle on the other side of the road against the direction of oncoming traffic is not allowed. The maximum speed you are allowed to drive on our metropolitan and national highways is 120 km/h (75 mph). On all other public non-urban roads the speed limit is 100 km/h (60mph), except inside urban areas where the speed limit is 60 km/h (35 mph). There are exceptions, so keep your eyes on the road signs. It is a legal requirement that you have a valid and non-endorsed driver license with you when driving on South Africa's roads. It has to be printed in English and issued by the country in which you live, bearing the holders signature and photograph. In addition and to play it safe, it is good idea to also carry an international driver license, which should also be printed in English. In South Africa there are three ways by which the flow of traffic is controlled at an intersection, 4-way stop signs, 2-way stop signs and traffic lights. Coming to a 4-way stop intersection, traffic from all four directions has to make a complete stop before it may proceed. After having stopped, vehicles may proceed in the order they arrived, that is first one to stop is first one to move. When vehicles arrive at the same time, good driving manners apply and the one yields to the other. Then there is also the 2-way stop intersection, where the traffic in the two opposite directions with the stop sign has to make a full stop, while the traffic in the other two opposite directions has the right-of-way and may proceed across the intersection without stopping. Take good care, a 2-way stop is considerably more dangerous than a 4-way stop. Stop when the traffic light is shows red. A green light gives you the go ahead to proceed. Be careful however, have a look around at the other traffic and take it easy. When turning right from the left-hand lane when the light is green, the oncoming traffic has precedence. Wait until it has passed before proceeding. The situation is different when you turn left from the left-hand lane. In that case you have precedence over the traffic from the opposite direction turning right from their left-hand lane. Have a good look around and be careful. Reduce speed and stop when the light turns amber or orange, it will go red any minute. A light with a green flashing arrow signifies you have precedence to proceed in the direction shown by the arrow. When the flashing arrow is red and indicating a left turn, it must be regarded as a yield sign and you may turn left if there is no other oncoming traffic. When the arrow light is not flashing, but shows a steady green or red light, you may proceed in the direction shown with caution. When traffic lights are out of order, the intersection is to be regarded as a 4-way stop. Always yield to the traffic driving inside the traffic circle. Vehicles already in the circle always have precedence. Enter the circle with caution after all vehicles coming from the right have passed. National Parks of South Africa. South Africa has a large and widespread network of petrol / servicing stations along both main and country roads. Most of them are open until late at night or even 24 hrs a day. Along the national highways and main roads they are complete service stations, including restaurants, restrooms, shops and often a repair shop. Ultra City, 1-Stop and Star Shop are familiar names. These service stations are dispersed along the highways in such a way, that you can make a rest stop every two to three hours. Highway service stations are open 24 hrs a day. In South Africa distances between petrol stations in the rural areas can be considerable, so it's important that you plan your refueling stops carefully. Petrol / servicing stations in South Africa are not self-service. When you pull into one, you will usually be met by a smiling attendant who will direct you to one of the pumps available. He or she will fill your car, check oil and water, clean the windscreen and, if necessary, check the tire pressures. If they don't, kindly ask them to do it. For this they expect a tip of between R3.00 and R 5.00 (South African Rands). It is good driving practice, especially on a long distance trip, to keep your motor car in a safe and optimum condition. Shell, Engen, Caltex, Total, and BP, are the most common brand names of fuel sold in South Africa. In addition you will come across South Africa's own Sasol brand at almost every petrol station. An excellent quality fuel, produced in our country from coal. In South Africa fuel may only be purchased for cash, credit cards and cheques are not accepted. Most of the larger fuel stations however, have ATM's on their site, from which you can draw the cash needed. But, to be on the safe side, ensure that you have sufficient cash for petrol when you are on the road. Leaded and unleaded petrol. From the beginning of 2006 however all leaded petrol is being phased out,so in the near future only lead-free petrol will be available. 93 octane (premium) and 95 octane (super) petrol is sold in the higher altitude and internal regions of the country. 95 octane (premium) and 97 octane (super) petrol is sold in the lower altitude coastal regions. And of course diesel is sold at virtually all petrol / service stations. Find out more about the current fuel prices in South Africa, they are linked to the dollar price of oil. At the coast fuel prices are somewhat lower than in the interior. 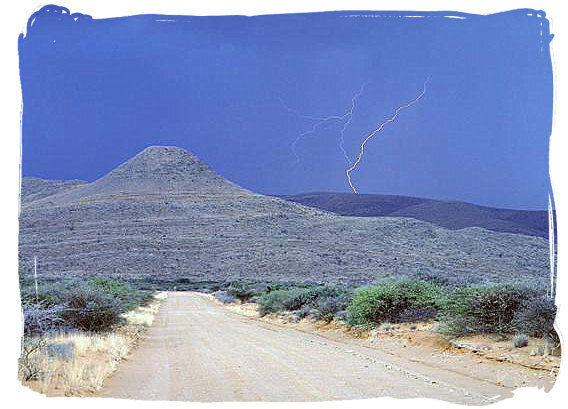 Planning and preparing your journeys in South Africa also means preparing for the event of a road accident or emergency. 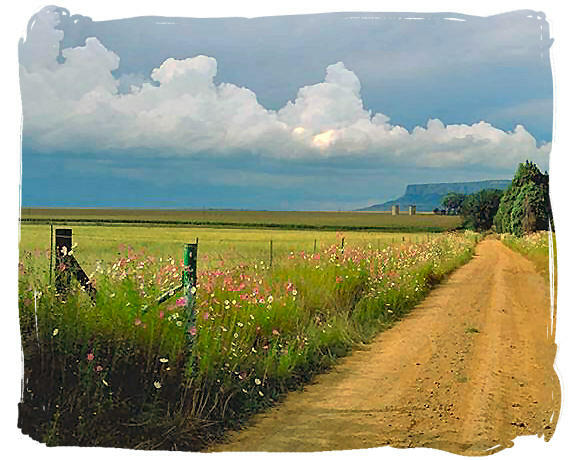 As a tourist you will most probably be using a rental vehicle when driving in South Africa. Car rental companies usually provide you with a step by step South Africa driving directions guide, for you to follow in the event of an emergency. Help is only a phone call away. Make sure that you have a fully operational mobile phone at your disposal. This can either be your own, or one provided by the car rental company. It is often part of their rental package. 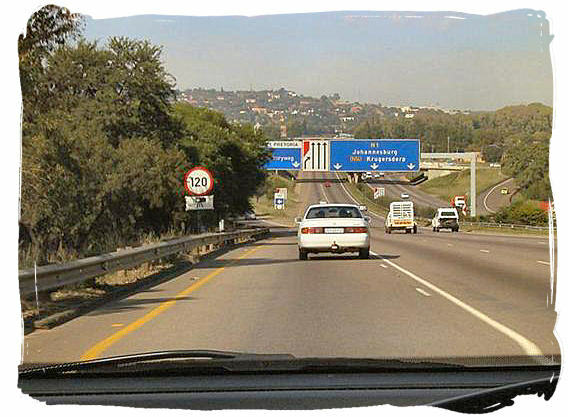 A comprehensive SOS communication system has been installed alongside the major highways in South Africa. Fixed SOS telephones are spaced at 2km intervals from each other, enabling you to reach help and alarm centers very quickly. Take stock of your surroundings and make an assessment of the situation. Find put your location on a map. If you do not have access to a phone and if there is no other help around, stop a passing vehicle. Ask the driver to call for help. Relax and stay calm, help will be soon on its way. Travelling in South Africa is as safe as in any other tourist destination in the world if you take the normal common-sense precautions such as you would anywhere else. Simply stay alert and be aware of what's going on around you and you will most likely enjoy a problem-free holiday. In cases of uncertainty about the safety of a particular event, activity, attraction or area you are welcome to contact the safety information number 083 123 2345 of South Africa's department of tourism. You may also use this number for practical guidance and assistance with regard to reporting incidents and lost documents. Check beforehand that the areas or attractions you plan to visit are safe. Ask the staff of your hotel or your host. When in doubt, contact the National Tourism information and safety line at the number shown above. Do not wear valuables such as jewelry, handbags, cameras etc. too obviously in areas that are regarded as risky. Do not leave these on the back or passenger seat in the car in full view. Instead keep them out of eyesight and rather lock them away in the trunk of your motorcar. When you stop for a rest, do that at a service station or a public area or place in a town you are driving through. Be very careful when you stop off the beaten track and do not wander around in deserted areas. Hijacking of cars does happen in South Africa. Take care when you have to stop at a stop street or traffic light or when you arrive at or leave premises. Watch out for approaching strangers at these places, close your windows and lock your doors. With regard to hitchhikers, however likeable and innocent they may look and with respect for your sympathy for their situation, do not pick them up. Even if they seem to have a problem, you should rather stop in the next town and report it to someone there. Look for well lit, busy and, if possible, security patrolled parking areas when you want to park somewhere. Virtually all shopping centers have security guards in their parking lots who will look after your vehicle in return for a tip that may be anything between 2 and 5 South African Rands. Often they are also paid by the shopping centers themselves. Like anywhere else the ATM (Automated Teller Machine) is a favorite target with criminals, especially the con artist type. Do not ask or allow strangers to assist you under any circumstances, especially if your card gets stuck in the machine. Should that happen, rather enter your pin three times, upon which the ATM will keep your card. Your card is secure now inside the bank and all you need to do now is go inside and ask to release it. Alternatively you can find assistance by calling the helpline phone number that the ATM machines carry. 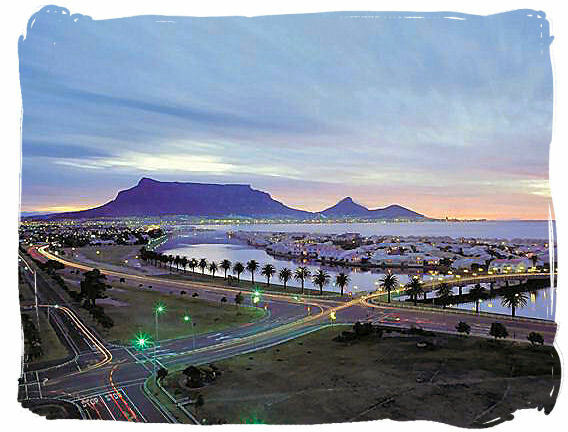 Come with us on this video tour of South Africa and discover the beauty of our fascinating country. 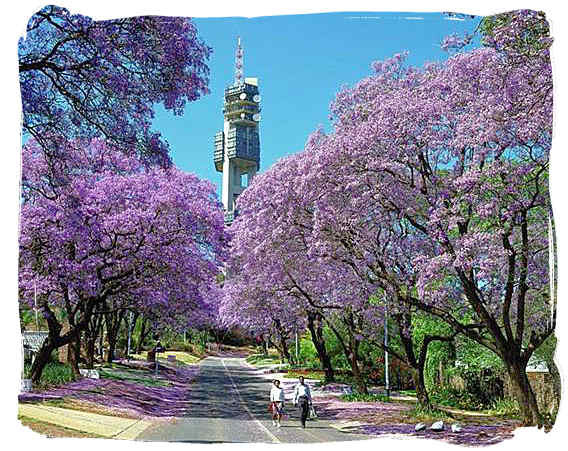 Discover the city of Port Elizabeth, the sunny end of the famous Garden Route.